The tower of St Beriana – or Buriana, the spellings have wandered – dominates the south side of West Penwith and is visible from miles out to sea. Granite and solid, it has survived every storm the Atlantic has thrown at it. The church receives two stars from Simon Jenkins, largely because of its original rood screen which has been very sensitively restored. We were initially less convinced. The porch is rather over-elaborate with pinnacles and battlements, going one better than nearby Breage. Inside, the space is light and airy as one would expect from a church which retains its perpendicular windows and has three full-length aisles. 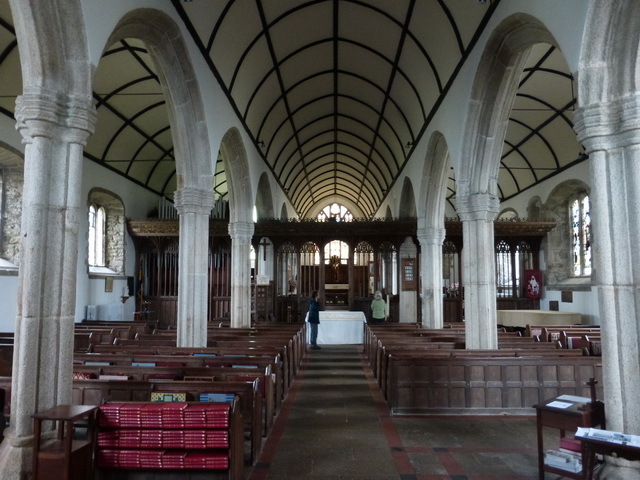 It is also tall like its neighbouring Paul church and has a long unifying ceiling. 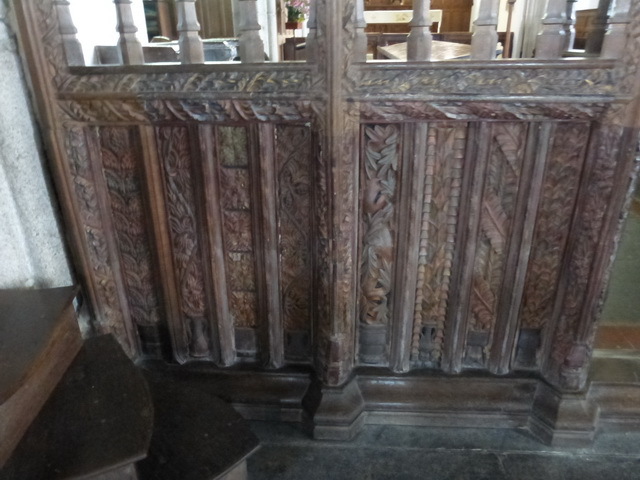 It is actually the rood screen which prevents the church being as welcoming and inclusive as Paul, shutting off the chancel and necessitating the awkward insertion of a nave altar in front of the screen to make the celebration visible to the congregation. If that were all then one would argue strongly against the two stars but closer inspection of the screen shows that it has real quality. Some colour even survives. Sadly, despite the general lightness of the church, the screen is hard to make out in its details and the canopy well-nigh impossible. Oh for a stepladder to get closer to admire the interlacing. At the back of the church, a C13 monument suffers the usual indignities of a ‘shared community space’ being hidden behind a children’s play table. Another fine slate monument records the generosity of the Levelis family who died out in the C17. Outside two fine slate monuments are hard to miss. The first, to John Hutchens is simply a lovely delicate piece of carving which has not weathered. The second, to Thomas Williams (d1795), and latterly his wife, is inscribed ‘Sleep here awhile the dearest part of me: in little time I’ll come and sleep with me’. Mary, his wife, died the following year. There are also two fine wheel-headed cross heads. 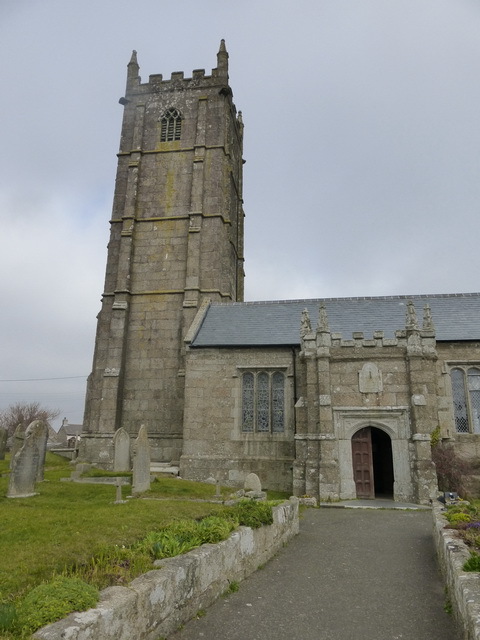 St Buryan has a very interesting history because it was a Royal Peculiar, having been released from the Bishop’s care by a charter of Athelstan in 930: the same Athelstan who recognised Cornwall as a separate country. Augustinian canons were installed. This led to endless disputes, and even fights, until all was settled in 1864. All this is explained, up to point, in the guidebook, updated in 1998, which is probably one of the most readable we have yet come across even if it struggles, unsurprisingly, with the finer points of the ins and outs of the arguments. The church deserves another visit to study the screen in more detail. Until then, we feel the two stars is generous compared with the single star given to St Levan.